As this is the final State of the Union of Obama’s first term (and perhaps his presidency), there’s no doubt that many around the world will be paying attention to what the president says tonight. According to ABC, an estimated 43 million viewers watched Obama’s State of the Union last year. 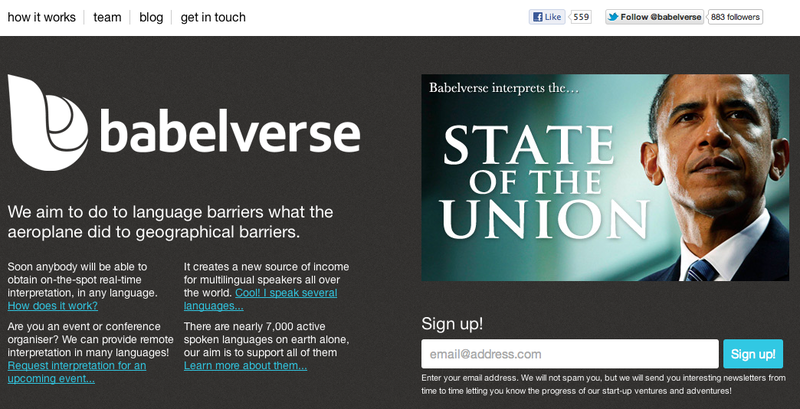 Thus, the team behind Babelverse, a European startup that grabbed third place in this year’s Le Web startup competition, announced today that they will translate the State of the Union address into as many as 6,796 languages. Babelverse’s goal is to create a realtime, universal translator, in which people from all over the world can converse in realtime, in their own languages. It’s an exciting idea, and is obviously meant to draw on the story of the Tower of Babel — and Star Trek. Babelverse plans to incorporate a user-generated ranking system to improve quality of translations, making it clear whether translators are professionals or amateurs. They have a long road ahead, but making realtime translations of the world’s many languages available to everyone, anytime, everywhere, and on any device is an ideal worth pursuing.